All Jupiter ionizer cells are manufactured in Jupiter’s state-of-the-art factory in Japan. Their research department has existed since the early 1980s and employs about 20 Engineers with Doctorates ensuring that Jupiter ionizers continues to out-perform and out-last the competition. This quality control also extends to the new Biostone filters. For Lab Results Please Click Here. All ingredients are put into the filter housing where sealing is achieved by using high motion heat friction thereby avoiding the need for any harmful chemicals. As used in the Microlite, Melody, Orion and Aquarius models. The older Jupiter filter removed from the incoming water chlorine, bad taste, Guardia, cryptosporidium, all other common water micro-organisms and other contaminants. What remained was good tasting, clean healthy water with the essential alkalizing minerals remaining. Compare this to Reverse Osmosis, Distilled Water and most Bottled Water where you get clean water that is highly acidic with all the essential minerals removed! To give you an idea of how fine these filters are – there is over 25,000 microns in one inch. There are 250,000 .1M in one inch. Silver is also impregnated into the carbon to make sure that bacteria do not grow there. Because it is embedded, or impregnated, into the carbon, the silver does not leach into the water. Tests done by the Seoul Department of Health show that no silver is released from these filters. 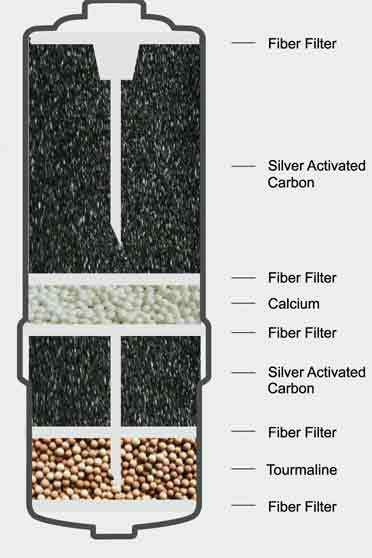 The New Biostone Filter is the same size as the standard filter above but improved to also include layers of calcium with magnesium plus layers of Tourmaline. The calcium is Japanese premium grade. It not only helps to slightly remineralize the water but also naturally sweetens the water and changes volatile fluorine molecules into a benign compound (calcium fluoride). The tourmaline (read More Here) in this patented, state-of-the-art filter really makes a difference to the ability of the water to carry an ionized charge naturally. As the water passes over the tourmaline crystals the ORP is naturally decreased and the water made more bio-available. What this means is if water passes through your Jupiter – even with the power turned off – the water will come out more ionized! Optional upgrade filter available for the Microlite, Melody, Orion and Aquarius models. Also called a hollow membrane filter this filter is the same size filter that is used in kidney dialysis. It is the finest (smallest micron) domestic filter available and will remove virtually everything except for the essential alkalizing minerals. Typically, if on city water we recommend the regular Biostone filter but for well water and where there is hyper-allergy issues we recommend the .01M Biostone filter. IonLife International also carries perhaps the most comprehensive range of pre-filters and whole home systems in the USA. All the latest Jupiter Science ionizers have a digital readout that shows how long before you need to change your filter. A filter typically lasts a family of four between 8 to 9 months and gives a good 1000 gallons of water. We recommend changing the filter at least once every 12 months to ensure quality performance. How often you change your filter will depend on the quality of your water and the amount of water you are using each day on average. If you smell or taste chlorine in your water after it passes through your Ionizer you should change your filter. In some city water supplies the amount of chlorine now used is at higher levels than before due to increases in contaminants. Also if you notice that the flow rate through your filter has decreased to a slow rate then it is probably because it is full of particles and now needs replacement. Anyone who wants the finest carbon domestic filter available in the world today. The regular Biostone filter is, nevertheless, an excellent choice for typical city water. The price for the regular Biostone filter is $59 (and the .01M Ultra Biostone $89). This gives a value of about $1.50 per week for quality clean, alkaline, ionized water for all your family’s drinking and cooking needs. « NEW FILTERS!!!!! IonLife has Specialty Water Ionizer Filters for their Jupiter Ionizers! Descriptions are BELOW!!! !